Do you have actual C64 screenshots of a game that, although released, is nowhere to be seen? Then please contact us with the relevant info and screenshots in order to be included in the present column. This arcade adventure needs no intruduction. It was reviewed in ZZAP!64 issue 87, receiving a massive 94%. 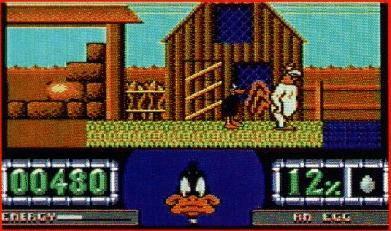 The game is multi-load, loading each of the seven colorful cartoon levels separately. It probably takes up one disk side. The first level portrays 'The Film Studio' as a horizontally scrolling corridor with enemies to jump over or temporarily stun and includes doors that lead to various rooms and film sets. Some of the characers encountered can be talked to: a menu of set phrases enables you to say 'hello', ask what they're doing and if they have any helpful tips. They sometimes give you useful items, but only if you bring them a requested object. 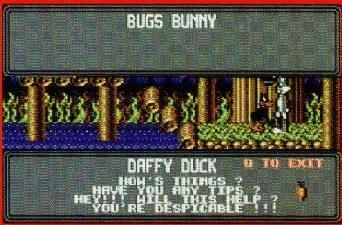 The second level takes Duffy underground to 'The Sewers' under the film studio, past gushing pipes and mutant fish as he searches for an exit key. Several electric force fields stand in the way and must be turned off by finding and flicking the right switches. Level 3 is 'The Desert'. Here you meet Road Runner (just try having a conversation with him! ), Wile E. Coyote and Speedy Gonzales, who (for some reason) requires a detonator and rocket parts. These are scattered all over the barren, horizontally scrolling landscape with many huge crevasses, crossed by jumping on moving platforms. 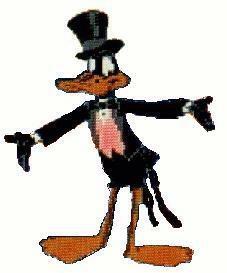 Like most cartoon characters, however, Daffy can take a lot of punishment: even if he falls down a ravine, all he loses is a bit of energy -- which is just as well, because he only has one life. Level 4 is 'The Farmyard', where Daffy has to dodge squirrels, birds and falling accorns, while looking for eggs to take to Foghorn Leghorn, the large white rooster. Water also causes problems as Duffy, despite being a duck, can't swim and has to hitch rides on friendly alligators and frogs. Level 5 is 'The City' where Daffy faces more dangers before progressing to Level 6: 'The Forest', in which he has to help a pygmy bake a cake! 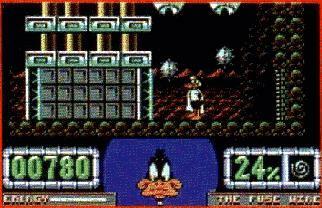 Finally, in level 7, Daffy Duck leaves this planet and goes to Mars, where he has to defeat some alien invaders!!! You can see the amount of work that's gone into creating Daffy's cartoon world with some superlative backdrops and most of his friends making cameo appearances. Of course, Duffy himself is the star of the show, perfectly drawn and animated. He even wears different costumes to suit each level, eg a hard-hat with lamp in the sewers! Indeed, all the sprites, both animated and stationary, are masterpieces of computer art. Equal attention has been shown to gameplay. There's nothing revolutionary, but it's excellently implemented with each level having a distinctive flavour. With simple controls and easy-to-use speech menus, the game's easy to get into and very compulsive. The seven levels are mainly collect-'em-ups, with a small amount of problem solving thrown in for good luck. Presentation 87%: Neat intro, long levels make multiload tolerable. Graphics 94%: Colorful backdrops are superb. Daffy is perfect. Sound 85%: Jolly tunes aren't cartoon style but still good. Hookability 93%: Jumping around collecting objects is compulsive. Lastability 89%: You only have one life to explore varied levels. This article heavily based on the ZZAP!64 review of the game (August 1992). Winner: Terence Honeyford, Buxton, Derbyshire. Hi-Tec, famous for their high-quality cartoon licences, are having a spot of bovva! Severely affected by the recession and the spectacular fall of the Amstrad CPC, the boys from Sheffield are currently looking for financial backers. So there we have it -- if you've got a few hundred grand to spare, buy 'em out. If not, grab a copy of the brilliant Daffy Duck instead -- companies who produce software of this standard shouldn't be allowed to die! Anyone knows names of programmers or people associated with producing this game? Pls contact us! Anyone has reviews of this game in a different C64 magazine of the era? Commodore Format perhaps? Pls scan it at 115dpi and send it over so any new information/screenshots are added to the present article.